Feridonzadeh, Hassan, Cyrus Sabri, Reza. (1393). Window Design in Ardabil Traditional Houses for Conservation of Energy. معماری و شهرسازی آرمان شهر, 7(12), 1-11. Hassan Feridonzadeh; Reza Cyrus Sabri. "Window Design in Ardabil Traditional Houses for Conservation of Energy". معماری و شهرسازی آرمان شهر, 7, 12, 1393, 1-11. Feridonzadeh, Hassan, Cyrus Sabri, Reza. (1393). 'Window Design in Ardabil Traditional Houses for Conservation of Energy', معماری و شهرسازی آرمان شهر, 7(12), pp. 1-11. Feridonzadeh, Hassan, Cyrus Sabri, Reza. Window Design in Ardabil Traditional Houses for Conservation of Energy. معماری و شهرسازی آرمان شهر, 1393; 7(12): 1-11. 1Msc. of Architecture, Technical and Vocational University, Ardabil Branch, Iran. 2Professor of Architecture, Urban Design and Landscape Architecture, University of California System and Virginia Tech, USA. Amraei, M. & Rahnavard, Z. (2005). Sash, Windows tothe Lighting, Samt publication. Ebnalshahidi, M. (2011). Effect of Window on Energy Efficiency in Isfahan Traditional Houses, Case Study:Ghazvini House. Gobadian, V. (2008). Climatic Analysis of the TraditionalIranian Buildings, Vol. 5. Hui, (2000). Scm. Climatic Design of Buildings- an Overview. Lecture Notes. Heidari, S. (2009). Architecture & Lighting, Tehran University. Ireland Government Printing Office, (2010). Energy Efficiency in Traditional Buildings, Ireland. Jame’e, B. (2000). Historic Buildings and Artifacts in Ardabil, Vol. 4. Kasmaei, M. (2003). Climate and Architecture, Isfahan: Khak Publication. Melukov, A. (2007). Thermal Comfort: Comfort Zone,Measurement and Analysis of Results, Technical University of Danmark. Mahdavinejad, M., Nasr, S. & Fayaz, R. (2008). Vertical Illuminance Measurement for Clear Skies in Tehran, Armanshahr Architecture & Urban Development, 4(8), 11-19. Memarian, Gh. (2005). Satiety in Theoretical Architecture Tehran, Soroush Danesh, p. 39. Shekari, Sh. Golmohammadi, R. Mahjub, H. Mohammadfam, I. & Motamedzadeh, M. (2008). Estimation of Illuminance on the South Facing for Clear Skies in Iran, Research Health Science, Vol. 8, No. 1. Sharples, S. & Heidari, S. (2002). 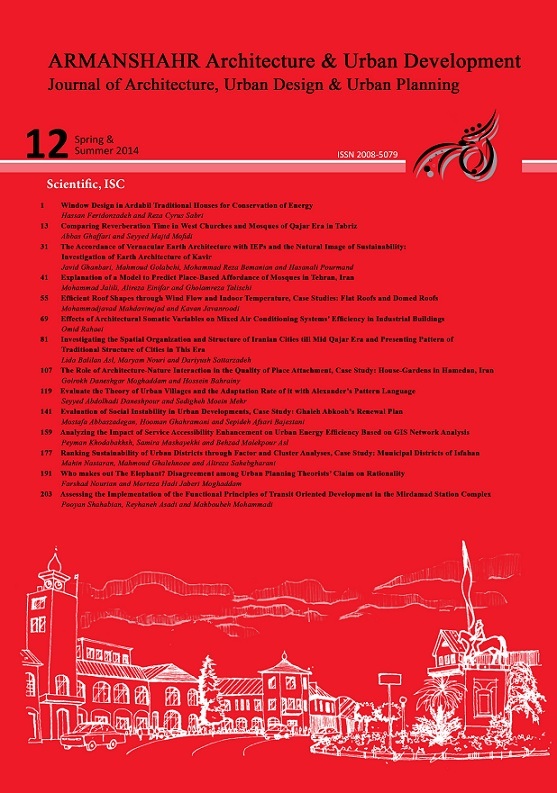 A Comparative Analysis of Short-Term and Long-Term Thermal Comfort Surveys in Iran, School of Environment and Development, Centre for the Built Environment, Sheffield Hallam University, 18 March 2002. Soltanzadeh, H. (1996). Old Windows of Tehran Cultural Research Bureau, Tehran, 307. Sheikhzadeh, Gh. et al. (2006). Review Canopy of Determine their Effect on Cooling of Buildings. 5th Conference on Energy Conservation in Building, Tehran. Zomarshidi, H. (2006). Iranian Architecture, Building with Traditional House, Tehran: Zomorod, 424.